What deer will not eat depends on time of year and local flora; a starving deer will eat cedar siding off a shed before the snow melts in late winter. A few landscaping strategies, however, will discourage them from raiding your garden. Put the right plants in the right place and most deer will pass on the entire area. As un-community-spirited as it may sound, if you have the least appealing “salad bar,” the deer may move on to the next neighbor. Design your landscape with lots of open spaces; deer look for cover before they sit down to dinner so they can escape quickly if necessary. Get rid of brush and clean out trees and shrubs with tender shoots. Place “sentinel” ornamental grasses at entrances to your yard and near plants that deer love. Terry Yockey of Northern Gardening insists that deer will not eat ornamentals like switchgrass, flamegrass, bluestem or fragrant prairie dropseed. Check with your local university extension or state native plant society to find options that are best for your climate and do not pose a threat of becoming invasive. Plant several deer-resistant plants for every plant deer find tempting. The Native Plant Society of Texas calls this “camouflage gardening.“ Black-eyed Susan and blood sage are native plants that deer avoid; plant big bunches of them where you notice deer browsing. Surround tulips with grape hyacinths. Surround vegetable gardens with herbs, French marigolds, snapdragons and nicotiana. Add plants with pungent smells and tastes that deer dislike. Start an herb garden. Deer hate really pungent herbs like mints (including bee balm and catnip), rosemary, oregano, chives, garlic and lavender. Grow yarrow and tansy in herb gardens for a little color. Naturalize bulbs like allium and daffodils, both members of the onion family. Use bulbs like snowdrops, scilla, glory of the snow and autumn crocus to produce a lawn that deer want to avoid. Plant shrubs and trees with tough or prickly leaves or woody parts to protect saplings and favorite targets like maples. 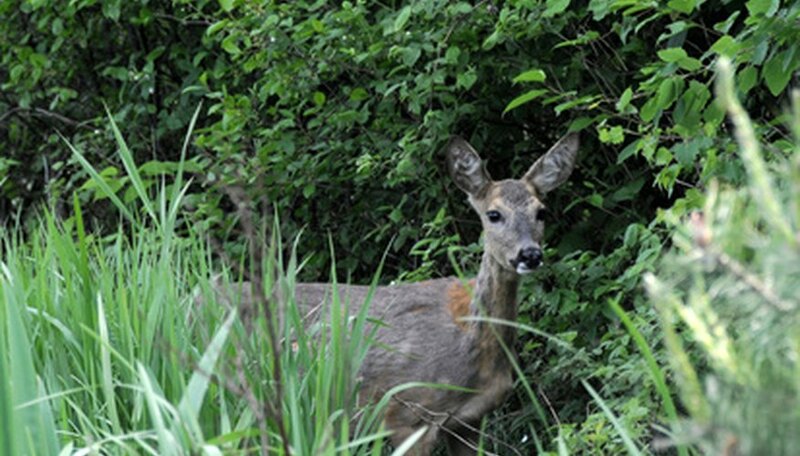 Deer avoid barberries, hollies and lilac bushes. Spruces and Austrian pines are seldom victimized and cedar wood contains toxins. Peonies, tiger lilies and poppies--all old-fashioned, deer-resistant favorites--will outlive those expensive, tasty hybrid tea roses. Popular "water features" and fish ponds are also attractive to deer. Landscape them with deer-resistant wetland plants like cardinal flower, wild ginger or lily turf. One of the reasons that deer show up for dinner is that people feed them. If see your kids or a neighbor feeding deer, have a friendly chat and try to convince them that they are contributing to deer overpopulation. Expanding exurban areas, limitations on hunting and people feeding deer all help create population pressure. In addition to turning deer into neighborhood pests, overpopulation often leads to Bambi being bashed by a car or slowly dying of starvation. If, in spite of all your efforts, your garden is being overrun by deer, contact your Department of Natural Resources or University Extension office for suggestions. Northern Gardening: Got a Deer Problem?